A book co-edited by Professor Robert Sklar, who passed away in July, has been posthumously published by the University Press of Mississippi. Co-edited by Saverio Giovacchini of University of Maryland, the volume brings together distinguished film scholars and cultural historians to complicate the nation-based approach to the history of neorealism. 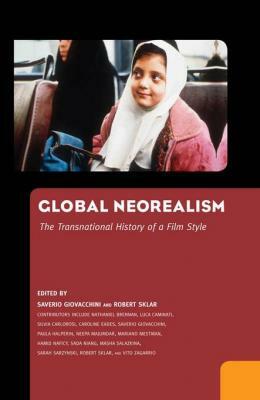 Global Neorealism: The Transnational History of a Film Style includes essays by the editors, as well as Neepa Majumdar, Masha Salazkina, Vito Zagarrio, and our own Nathaniel Brennan (ABD PHD), among others. The book has been praised by Cinema Studies alum Giorgio Bertellini (University of Michigan) and Richard Peña (Columbia University and director of the New York Film Festival). The memorial service for Professor Sklar will be held this Sunday, November 6th, at 5:30pm in NYU’s Kimmel Center. Co-editor Saverio Giovacchini is an Associate Professor in the Department of History at the University of Maryland, College Park. He is currently the director of the Nathan and Jeanette Miller Center for Historical Studies there. His first book, Hollywood Modernism (Philadelphia: Temple University, 2001) centered on the intellectual history of the Hollywood community in the Thirties and Forties.